Here is my latest build. It is a survivor kit having come from a collection posted on StuntHanger. This one is unusual in that it is 21-plus inches across, with a symmetrical wing. The plastic cowl hasn't been cut to fit an engine until I know which engine is finally installed. 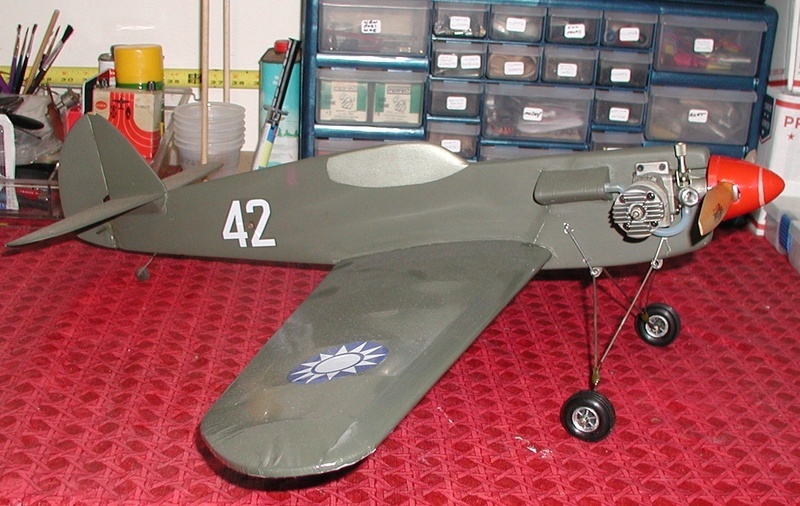 The plan (build instructions), decal scans, wood scans have gone to Dave Cowell aka DPCModels for reproduction. A buck has been cast from the cowl set, but needs to be mailed to Dave. 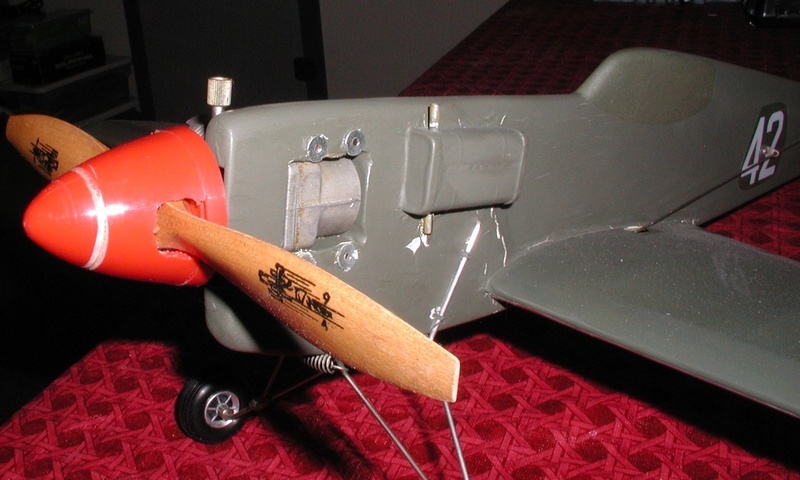 All original kit wood was used, except for the firewall and related 1/4" braces. The ply was delaminating, and the 1/4" balsa was not cut square between the firewall and fuse. 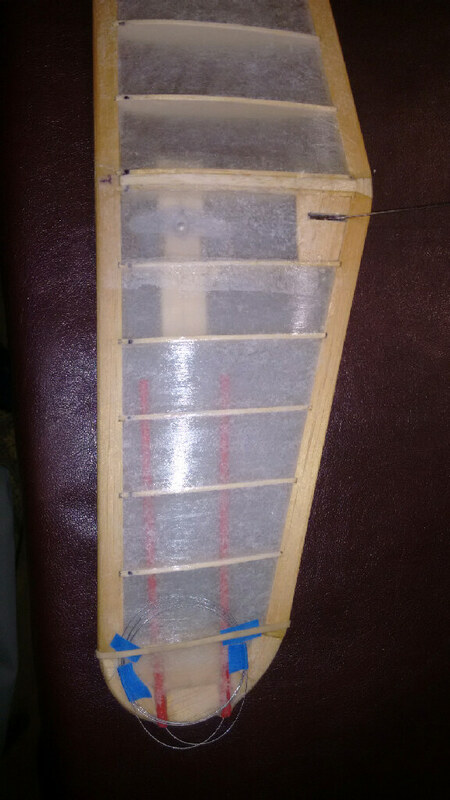 The original canopy was flat plastic...I molded the one you see using bass wood and a water bottle. The 57 yo decals were really a bear! I intended on going with an AP Wasp to the point that the nylon mount was drilled to fit the Golden Bee mounting pattern. First flights will be on the Bee. If it won't do a basic pattern then the AP and tank will get tossed on it. Great Build. Got to love the Scientific kits !!! 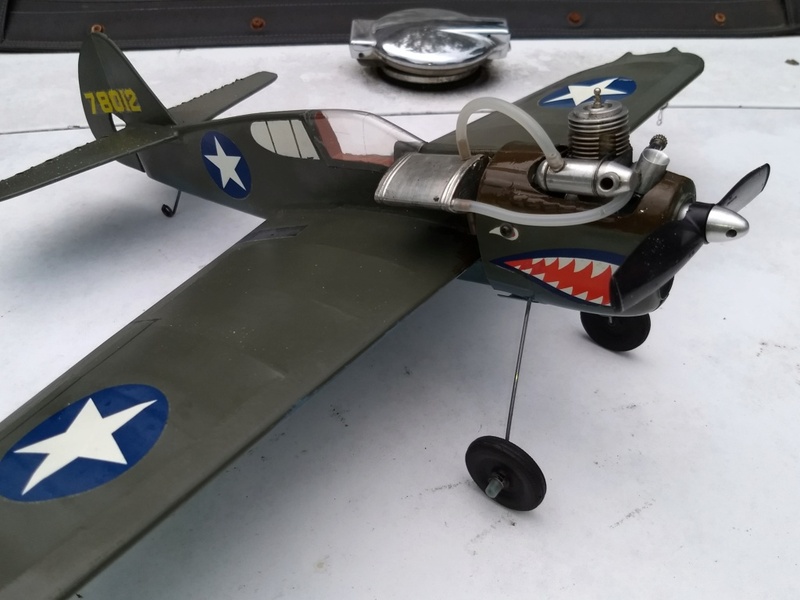 She is looking really good there Jim , Decals are Nice and the way you ran the lead out tube further into the wing makes some sense not to saw the ribs. I see you sowed your elv./stb. Nice i like them after doing a few the look has an impression on it . Hope the Golden Bee works out ! I just had to check the prop and spinner. This is the Golden Bee inverted. The needle hasn't been cut into the plastic. I don't like the needle topside without a cylinder in front of it for protection. If I go product engine pushed forward on a mount with a remote tank, then I can go port with the needle, and starboard with the cylinder. For that matter, I can flip-flop between product and AP. I just had to see the prop and spinner! looks good, i think you'd be good with the Golden Bee or Black Widow, less chopping on the plastic cowl and probably better CG than with the ASP with muffler and external fuel tank. I did a fingertip check on CG with the Wasp right after this picture. 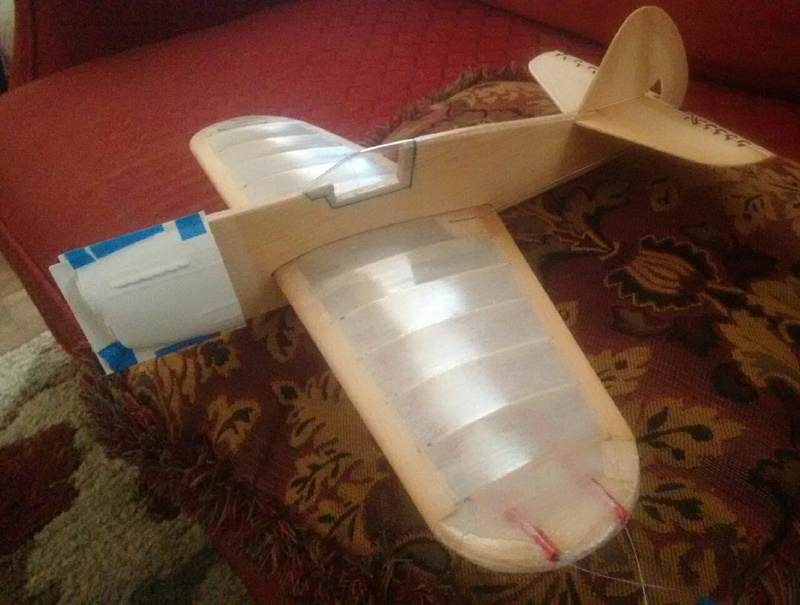 Without muffler and prop I'm about 3/4" behind the leading edge. I need shorter screws (tomorrow) to really get a handle on the Bee. I think you're right. The CG will probably shift back a smidge...better for loops! Today the weather was perfect! Sixty eight degrees, three to four mph winds...steady, not gusty. I have been checking lines, balance point, stooge release and line lengths. 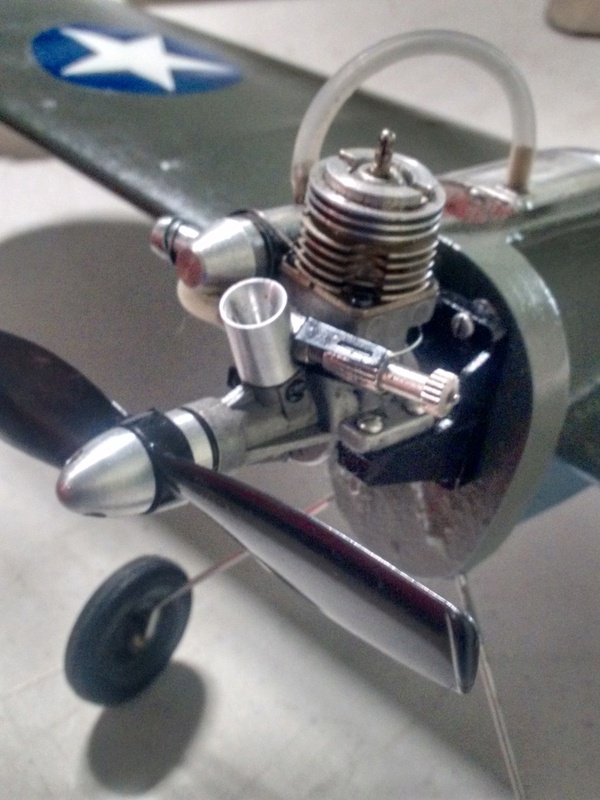 Prop, glow plug tight, lead-outs good! I walked the flight circle looking for gotchas, paced off the center on the trapeziod-shaped field...second ground check, third wind check. All good! Then I grabbed a chunk of 3/4" conduit to stab into the grass for my center. A key ring was secured on the top, and my flight lines attached to establish my circumference. By now all the contractors in the building were watching...probably taking bets in whether I fly or prang the bird. With center and circumference established, I laid down a few sections of rubber floormat for my runway. Then I hooked the lines to the plane, and the plane on the stooge. Having built a new flight box, I connected my glow plug leads and promptly smoked three glow plugs! Ok...slow down. Double checking shows I plugged the glow plug leads to the starter sockets-doh! With glow plug number four installed, I ran a quick ground tank to baseline my needle setting. 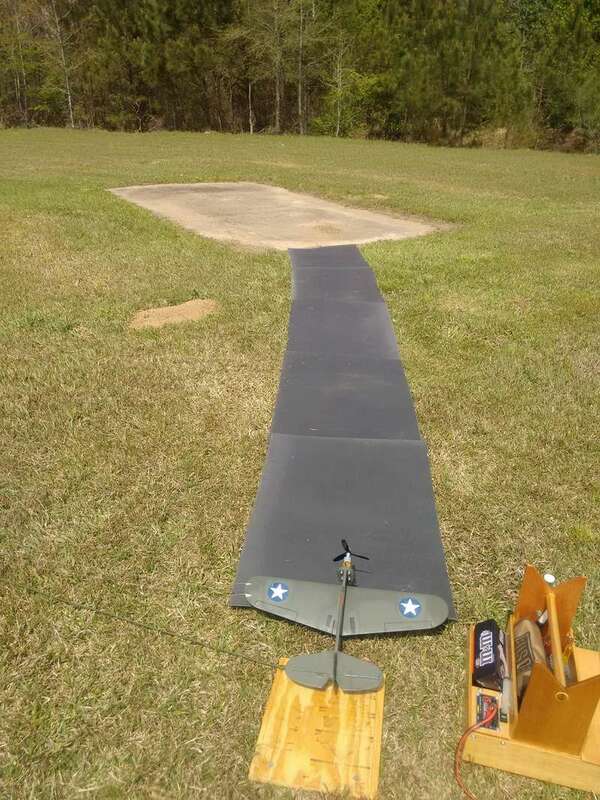 The first launch attempt had the tail skid come off the stooge and hang up on the rubber mat. The plane nosed over and stalled. Second launch was perfect! The plane lifted off in 15 feet. Line tension was great for 40 foot lines. 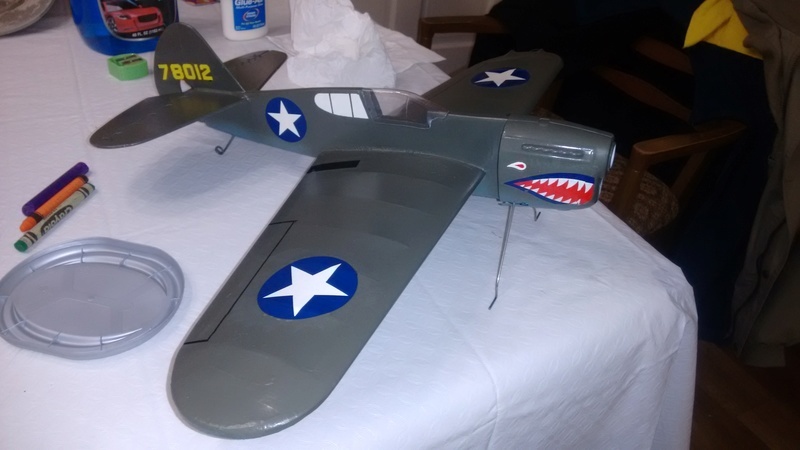 The airframe behaved wonderfully! I even managed my first, clumsy, almost-overhead, sort of wing-over (better than 75 degrees off horizontal)! 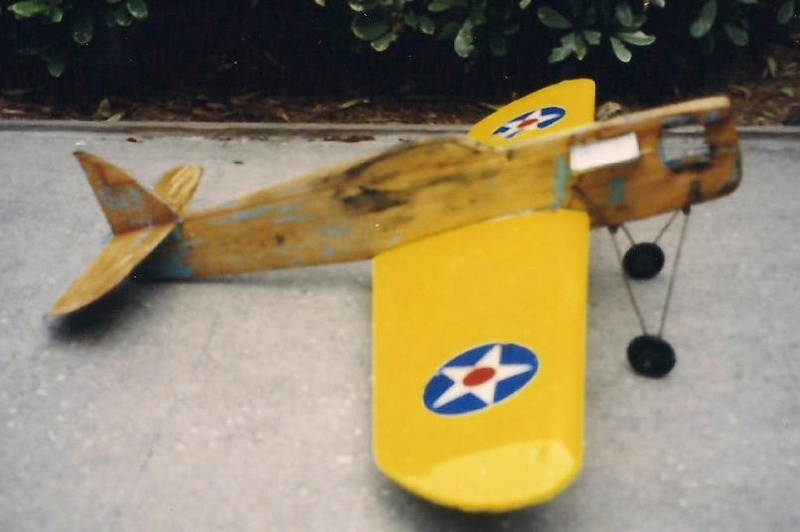 However, the old Golden Bee struggled after 45 seconds of flight each time for the next six flights. 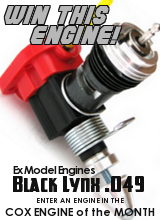 I think I rebuilt the engine with a Babe Bee 5cc tank kit (see my next thread please). Tomorrow I'll fit an AP .061 engine and 1/2 ounce wedge tank. If the weather holds, I'll try again. Unfortunately, that tank will be quite high on the fuselage...almost above the top edge of it. I call the plane a success despite the balky Golden Bee. Sounds like an excellent shake down-flight! Congratulations JIM!!!! Greenies for you sir! 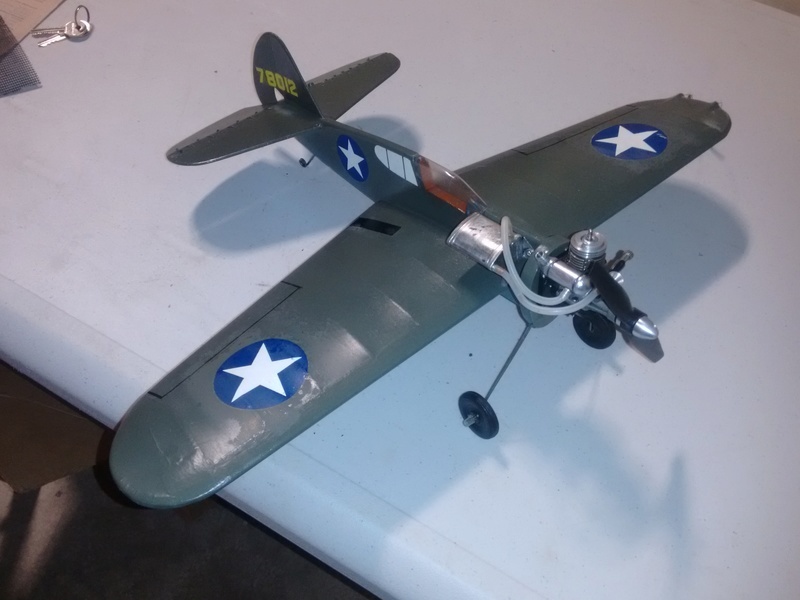 But I did mount the AP .061 with MA 6x3 prop and 1/2 ounce fuel tank. The custom venturi has the spraybar installed at an angle to keep fingers out of the prop, so I can't change the orientation. That means no upside down configuration with the starboard side draw. Two bench runs were made...one with no pressure, and one with muffler pressure. The pressure run ran for 2:45 mins. All of this is reversible in case I get the Golden Bee settled, but I think the bigger tank will Trump a hidden engine. Once a final decision is made on powerplant, the cowl will be fitted. I'm leaning towards the big engine sticking out of the cowl. The idea reminds me of the of "Zingers" plastic models of the '70s, where the engines were scaled twice as large as the vehicles. More to follow after the next few flights! ...well, how did it fly? looks great, nice build! Looks familiar to me Jim, right down to the red spinner. It's Sterling 28" wing bigger brother with Enya .19 power. 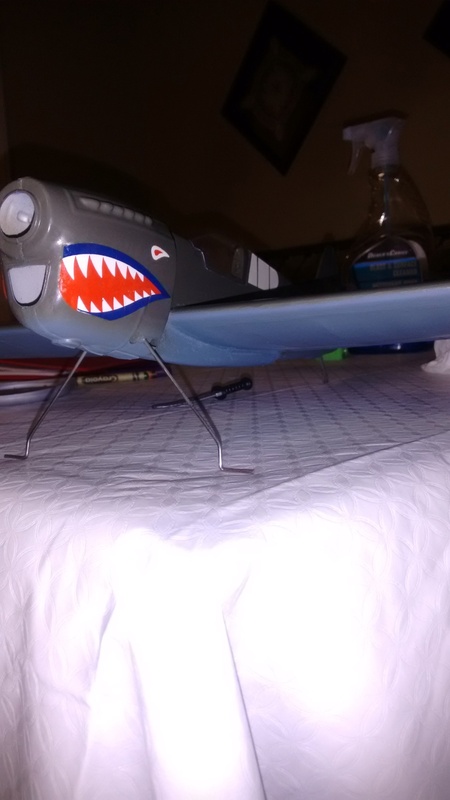 Flying Tigers version. My first real stunter however minor. 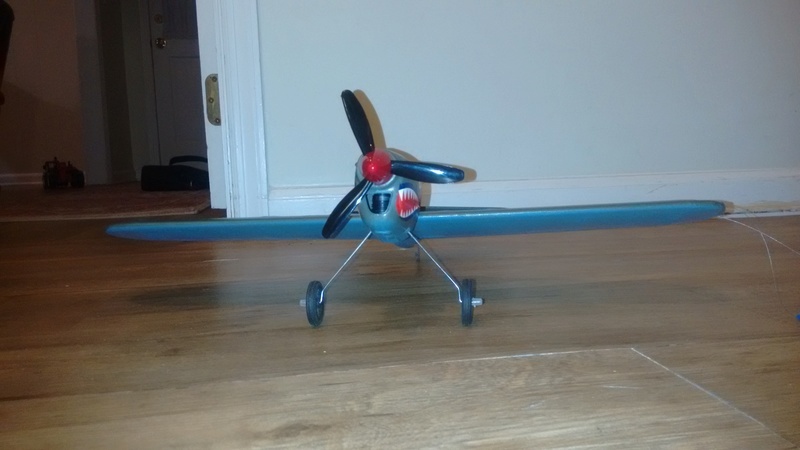 Did my first loops and inverted flights with it. I have "profiled" it here before. 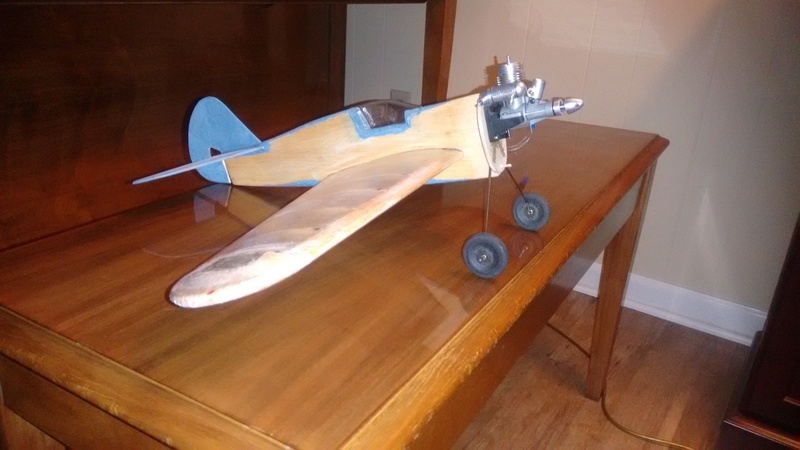 Built and flown in the late 60's and 70's and rebuilt a few times. I still like your canopy building methods. @ Mark: When the GB ran right, this thing really felt good. No twitchiness like my Wido Satan. Responsive and smooth. I do want to try to move the CH back a bit. With the GB it was 1/2" behind the leading edge on my finger tips ( I know, not very Scientific). Once Mississippi weather breaks, I'll fly with the AP and report back. It sure sounded good on the plane tied down to the bench! @ Bob: Thanks for posting the big brother. You did a fabulous job on the refurbishment! Any chance you have tracings/templates? Or could this one be on Outerzone/HPA? I have an AP .09 that may haul one around. Thanks for cheering on my canopies. If I figure out how to YouTube, I'll post the first flight. It is only 34 seconds...43 Megabytes. Hi Jim, It's an out of the box Sterling kit. rsv1cox wrote: Hi Jim, It's an out of the box Sterling kit. I found references: Sterling kit S7. Brodak kits it now. Oddly, Brodak want $70. An Italian eBay auction has an original Sterling kit at almost $200 coming stateside. I'll keep this kit in mind once the dust settles over all.of the other kits in the pipeline. Jim, where did you get the venturi? Jan Holuszko was making the venturi assemblies about 10 years ago. Norvel was pretty defunct at the time and Cox equipment was not up to par to fly 1/2A stunt. One could not find parts for the Norvel, so Hobby People was offering the AP .061 for under $30. The AP being similar to the Norvel engines at least appearance wise was a bit down on power compared to the Norvel and was basically the only game in town. Brodak's CS version MK1 .049 was the other offering at the time which was a huge turd. 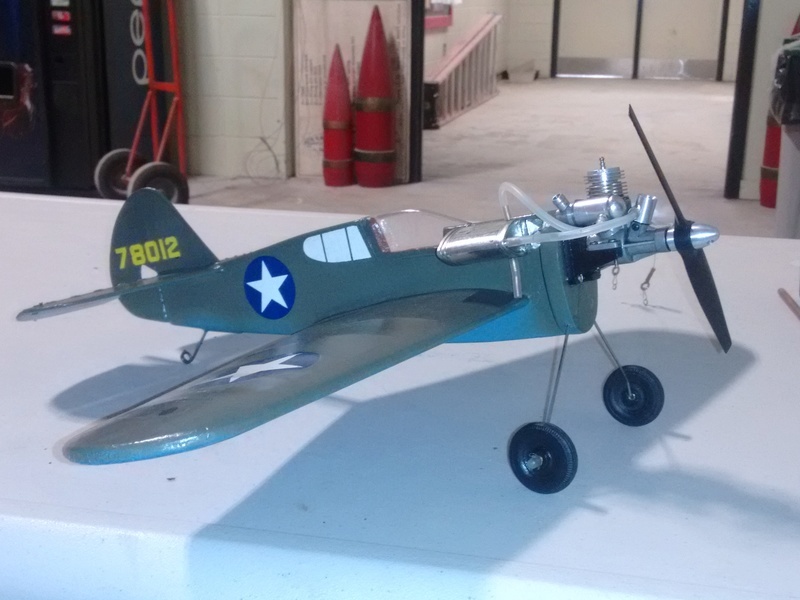 Jan used parts from the r/c carb provided with the AP and adapted them to his venturi. I made a adapter that utilized the same thread that the Cox TD venturi uses so I could screw in that assembly. Some just wired open the r/c carb and flew it as is. I believe you have one of Jan's venturi's on your engine and if possible it would be nice to see it up close. 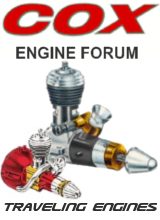 This engine was never offered as a control line engine. Eric Rule from RSM was selling those assemblies for more than what the engine cost. 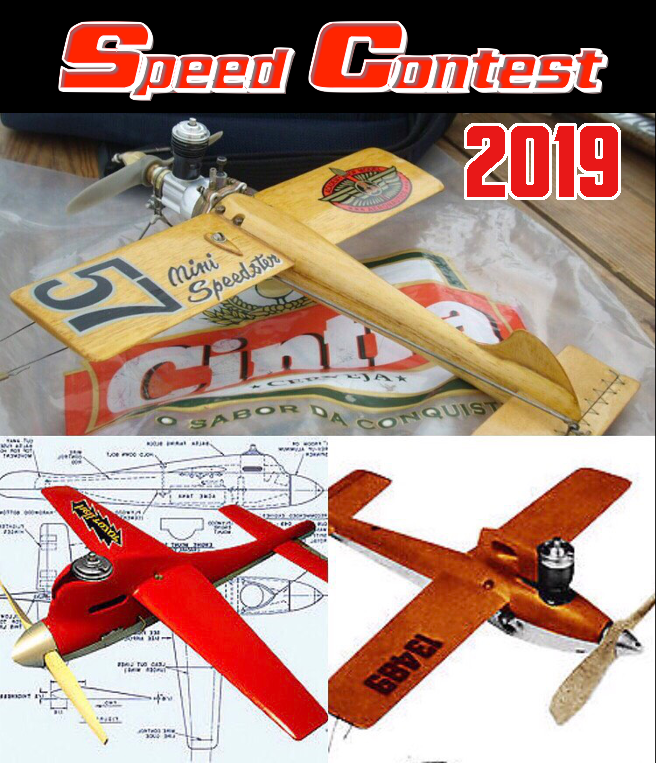 Larry Renger was using the AP in his newly designed Skysport with the Jan venturi and it was featured in Flying Models. Larry gave me the article that he copied. I have a few of the AP .061's but found them to have some issues and they now reside in the cabinet. Jan stopped making the assemblies some years back. How does it fly on the bigger engine? Great! This thing pulls like a small dog on 38' .008 7-strand lines! I will have to make a longer set. It takes 4-Mississippi to complete a circle. Yesterday I performed my first official Wing-over. The first inverted 1/2 lap turned into a stuck spinner in the dirt (Oops!). The second one was a few laps upside down, but it was late in the flight. 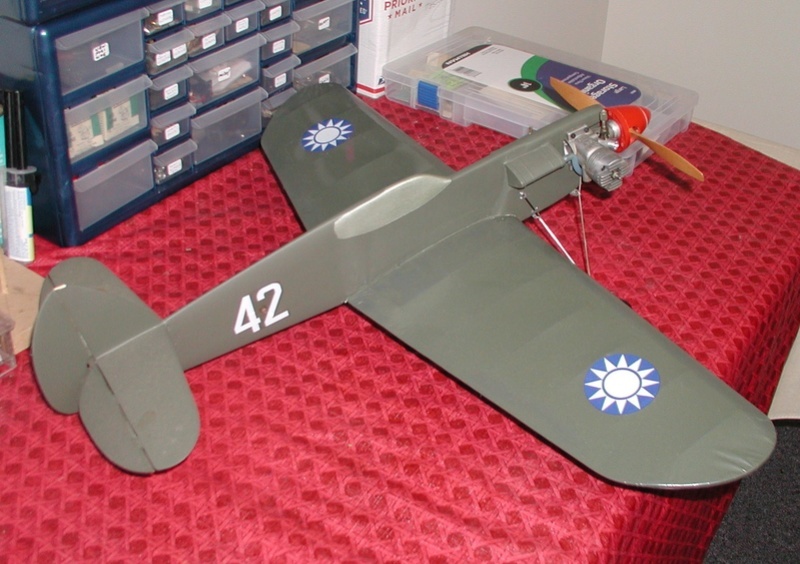 The rudder did not get snapped off during the canopy landing. Number three was several laps upside down. However, it was late in the flight. Recovering to right side up came with a flame-out, stall and another spinner dart in the ground. The outboard wing must have flexed, but not broken. Tissue needs to be fixed in the middle of one bay. Hopefully I still have enough of the home-mixed blue so it can blend in. Otherwise, this plane just gets it hard! I believe I'll keep this engine on it. Then my Wido Satan can have its Golden Bee back. Time to fit the cowl, and fix the paper. More to follow once I figure out how to make and post a video. The P40 was starting to feel neglected. So I finally mounted the cowl while paint dried on the Mossie. 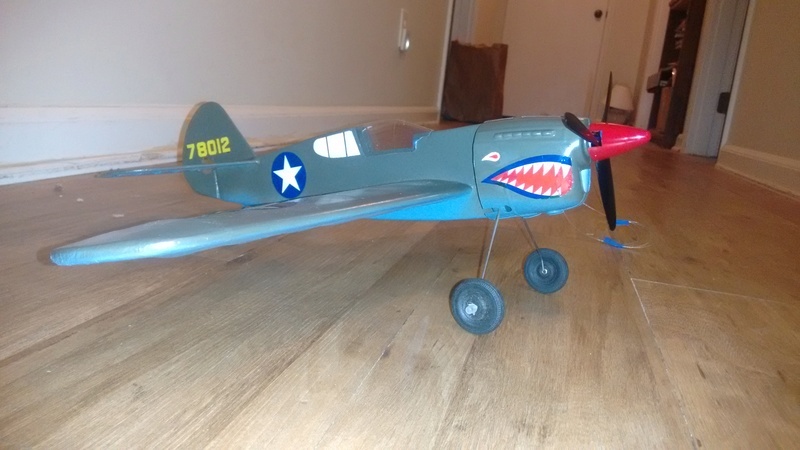 I hope to fly this one later this week. I have a 3-blade prop, and Cox spinner. I think I need a 7/64" drill bit before I tap the spinner adapter for the AP. Anyone know the AP prop stud size? That's just plain wicked looking!! It will probably wind up on 45 to 50 ft. lines before it's over with. Well, I can say I KNOW what happened to the Mosquito....it almost got this one twice tonight! 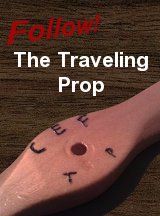 I had been using fiber washers gripping the "bridle" through the handle. The line slipped causing the plane to shoot up! I would up removing the fiber washers and almost crushing the line with the bare screw clamping it. That and a digital phone with a fully charged battery, and fully packed memory card means we get the late movie from my phone. 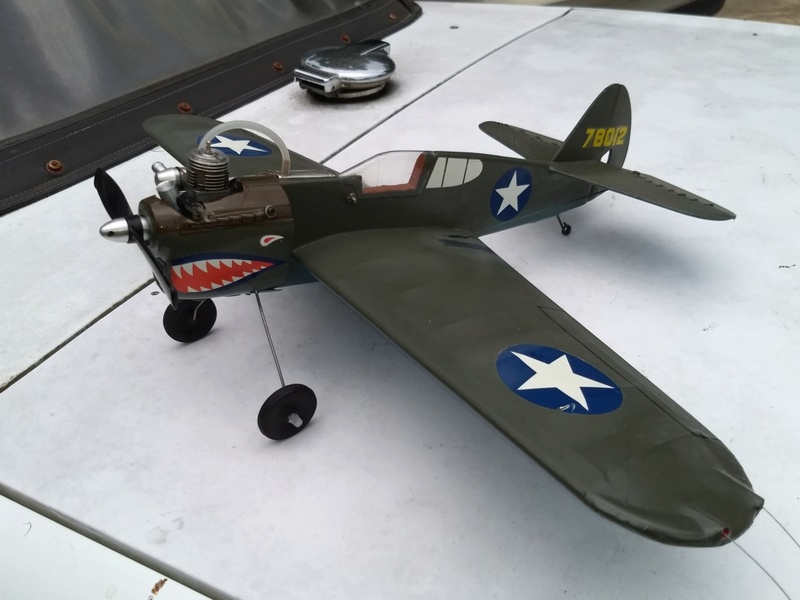 Without further adieu, a video of the P-40 flying. Wonderful. It's a screamer Jim. I always love that last couple of seconds lean out just before fuel starvation.